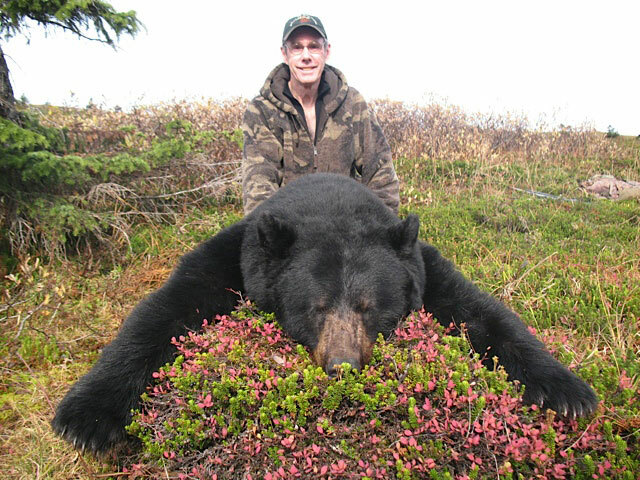 Spring Black Bear Hunts starting the first of May. This is a riverboat hunt with a spot and stalk hunt. 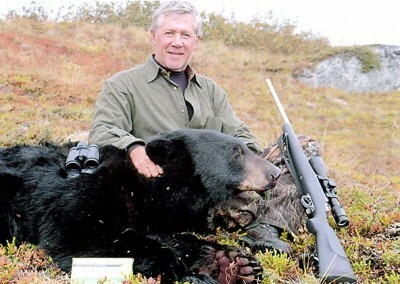 Most hunters will see over 20 bears per day. Excellent parent/child hunt. Two hunters, one guide, for ten days. Near 100% success. Size average 6 to 6.5 feet. 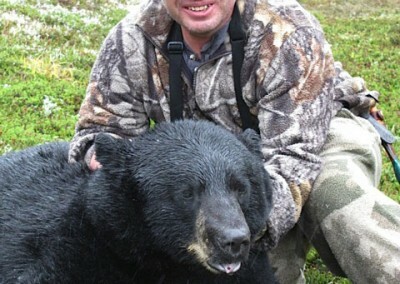 The name “black bear” can sometimes be misleading. About 30 percent of black bears are actually brown in colour. 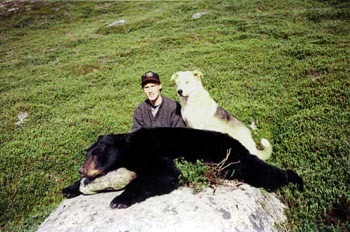 Rare blue coloured (glacier bears) and white coloured (Kermode bears) black bears occur in coastal Alaska and British Columbia. Although it has the powerfully muscled build of the bear family, the black bear is relatively small. Adult males average 135 kilograms in weight with a shoulder height of one meter. Females average 70 kilograms in weight. Compared to that of a human, the eyesight of a bear is similar, but its senses of smell and hearing are more highly developed. These senses enable the black bear to detect the presence of grizzlies and humans (the only animals that are a threat) as well as carcasses and carrion that might mean a good meal. The black bear began to move northwards into Northern British Columbia about 12,000 years ago. It was a time when the great ice sheets of the Wisconsin era were melting back into the mountains, and the boreal forests were slowly covering the fresh landscape. 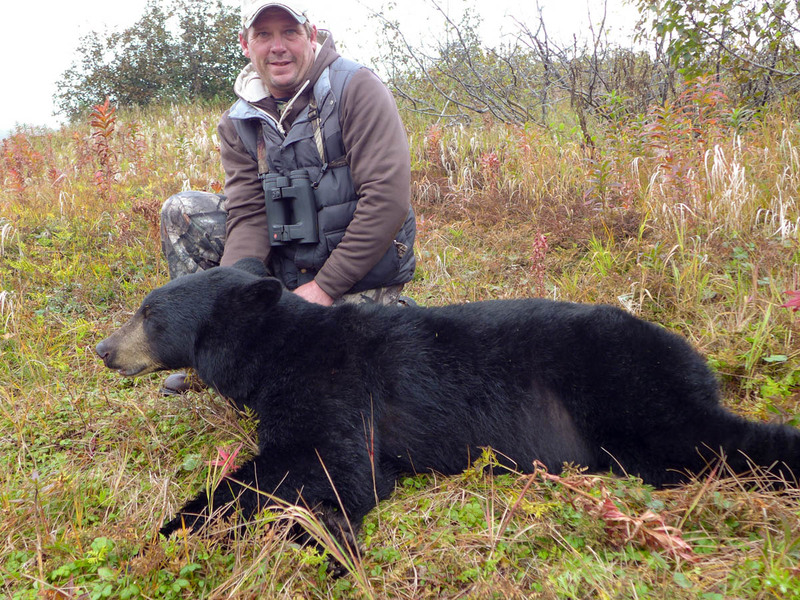 The evolution of denning behaviour was a key element in the expansion of black bear range into northern Canada. For this animal, a shorter foraging season simply means a longer denning period. At seven months, the denning period of a Northern B.C. 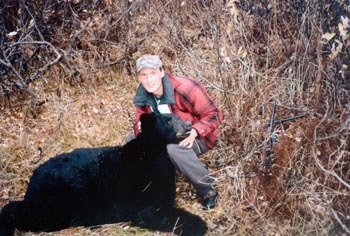 black bear is one of the longest of the species. Mexican black bears spend only a few weeks in the den. Mountainous terrain tends to reduce the size of each animal’s home range. Black bears need access to different types of habitat for food, water, dens, cover and concealment. Eastern black bears move great distances to meet all of these needs. 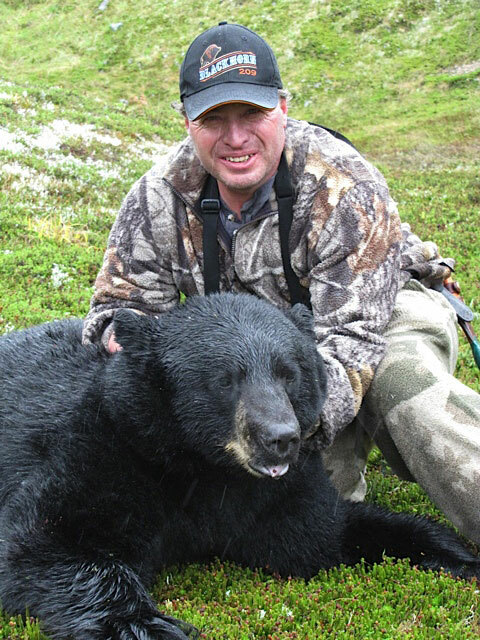 Black bears have only to move to higher or lower elevations to find different types of habitat. The presence of grizzlies affects the distribution and behaviour patterns of our black bears. Grizzlies may kill and eat black bears, and easily win the competition for food where their ranges overlap at river level and the subalpine zone. A black bear feeding on a salmon stream or in a berry patch will quickly move away when a grizzly arrives. 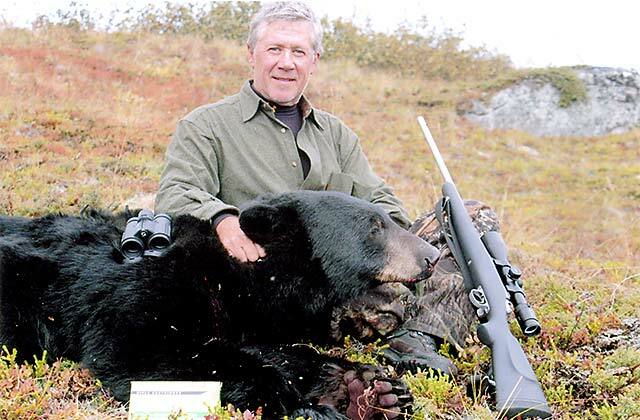 An important feature of northern black bears is their low rate of reproduction. A female black bear breeds for the first time at seven to nine years of age, and every three to four years afterwards. In its 20 year life span a sow will produce only two to four litters. 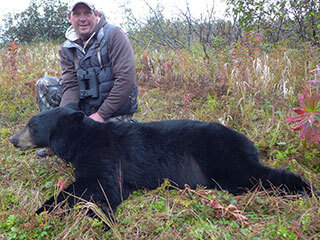 Black bears avoid severe winter by denning up before the worst weather arrives. 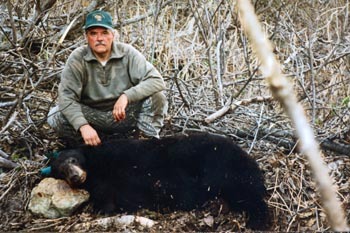 Denning habits vary between different populations of bears, and between individuals in the same population group. Dens can be dug into the ground, or situated under the roots of fallen trees or in other natural cavities. Northern dens are usually lined with leaves, grass, and twigs. Pregnant females give birth in the winter den during the month of February. One or two, and occasionally three squirrel-size cubs are born. By the time they leave the den in April or May, the cubs will weigh about 20 pounds. It’s a remarkable growth rate when you consider that the cubs have been nursed for three months by a mother that hasn’t consumed any foods or liquids. When longer days, warmer temperatures, and melting snow signal the arrival of another spring, black bears emerge from their dens. Males are the first to step out, usually near the end of April. Many black bears move to grassy south-facing hillsides as soon as they emerge. These slopes are free of snow at this time of year and the bears find overwintered cranberries and bearberries on which to feed. At river level, fresh growths of horsetails and willow catkins are important spring foods. Vegetation of one type or another makes up 95% of the black bear diet. However, unlike grizzlies, black bears seldom eat plant roots. Most mammals are too fast for bears to catch, but moose calves are an exception. 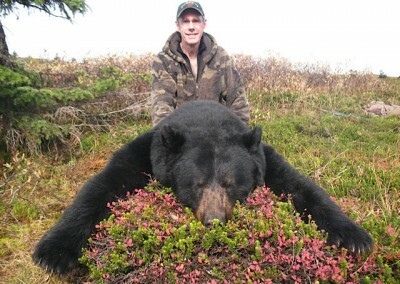 Black bears take from two to ten percent of the newborn calves. These kills were made in the subalpine zone where many cow moose give birth, but are also likely to occur in valley floor settings. Caribou calves are likely killed as well. 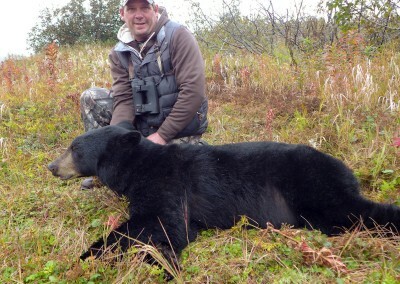 Black bears mate between mid June and the end of July. During mating season male bears travel widely, searching for females and following their scent trails. Breeding pairs stay together for a few hours, or a few days at most. Females with cubs remain in their dens about a month longer than other bears. The cubs usually stay with their mothers for two years, denning with them each winter. Females breed again only after their cubs have left or died, and may skip a year in between. Black bears make use of several types of habitat through the summer. Horsetails growing in openings in white spruce forests are attractive to bears in early summer. When soapberries ripen in July, the bears move into aspen and cottonwood stands. Soapberries grow along the margins of these stands and the fresh leaves of the aspen itself are also eaten. Summer is a hungry time for black bears. As the grasses and horsetails mature, their nutritional value declines. During these lean times, bears might climb trees to obtain cottonwood catkins, or fish for pike along the shallow margins of a lake. Some bears seek out campsites and garbage to supplement their diet. As summer progresses, the bears move into black spruce forests where ripening blueberries are found. If they’re not threatened by grizzlies, some black bears will move into sub alpine habitats where more blueberries and crowberries are available. In most years, energy-rich berries are plentiful during the autumn season. Bears gain weight rapidly at this time of year — as much as one to two kilograms a day. 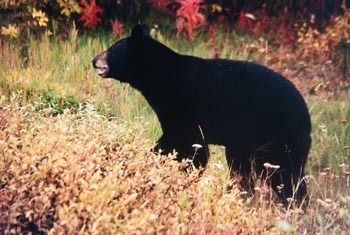 Berry crops are critical to northern bears which must survive with a narrow variety of foods and a short foraging season. When berry crops fail as they do every few years, black bears are forced to travel widely in search of food. Their desperation brings them into greater contact with people during these times. Berry crop failures can also affect the reproduction of black bears. Pregnant bears go through a process known as delayed implantation. This means that the embryo lies dormant in the uterus for several months, and does not begin to develop until November or December. During a bad berry year, if the female is in poor condition the embryos will not implant and no cubs will be born. This probably saves the mother’s life. In October, when the temperature drops and the snow flies, black bears search for new den sites and the cycle begins once more.